Whether welcoming invitations, stark warnings of impending danger, or shining beacons of comfort and relaxation, signs guide our world. 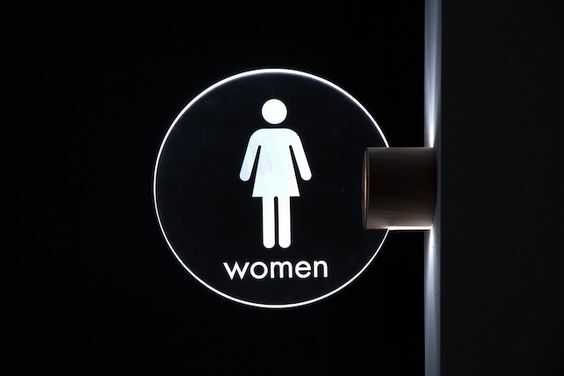 From simple restroom signs to directional street signs to 10-foot tall letters advertising corporations atop skyscrapers, signs are necessary communication tools that help us navigate the facets of everyday life, even if sometimes it may feel like they’re blockin’ out the scenery. Sure much of the signage out there is industrial, requiring elaborate engineering and professional installation. While fascinating, that’s not what this post is all about. Rather, we’re examining how makers like you can go about making signs to either sell for a profit or use to professionally brand businesses. So how can you communicate information to customers, prospects, family or friends with words or art? Let’s dive in to find out. Of all the maker endeavors, signs are some of the most straightforward laser cut projects. But that’s not to say sign making is necessarily easy. There are many considerations from size and material to design and overall aesthetics. 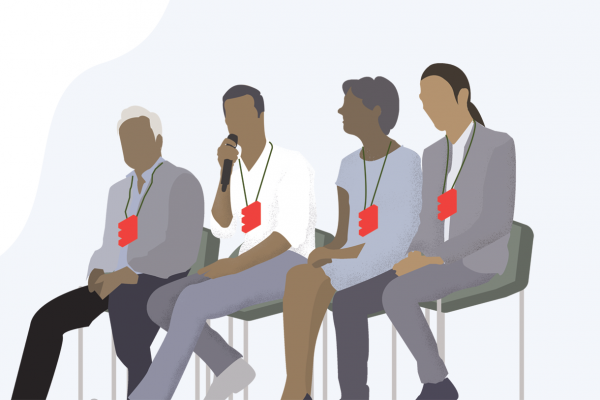 Audience: With whom are you trying to communicate? Age, gender, language, reading ability, etc.? Message: What are you trying to communicate? Directions, rules, ideas or images? 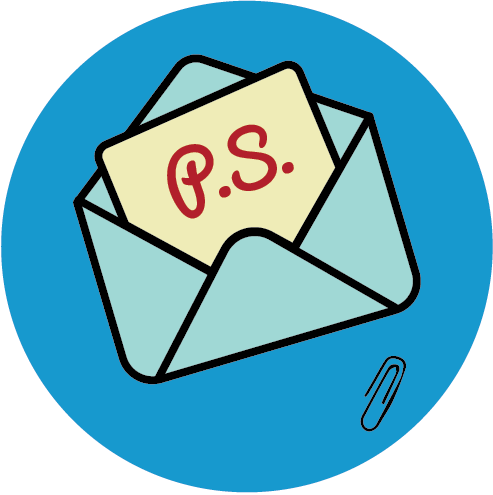 Delivery Method: What is the best way to convey the message to your audience? Verbally, graphically or both? At what distance does the message need to be seen? What colors can best communicate the message while attracting the audience’s attention? Where is the most logical location for the message so your audience can’t miss it? Once the audience, message and delivery method are determined, then you can get down to the business of making signs. Back in the day, you would need a tradesperson with the world’s steadiest hand to build or paint a sign. While hand-painted signs are seeing a resurgence, there’s (thankfully) another way for those of us who are not as artistically inclined. Enter laser cutting. 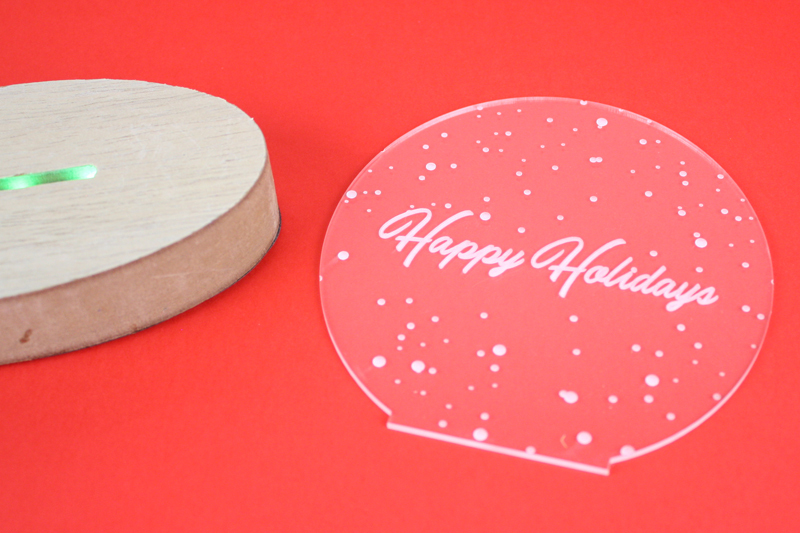 Laser cutters (or Instant Gratification Machines as we like to call them) are an easy solution for making signs. 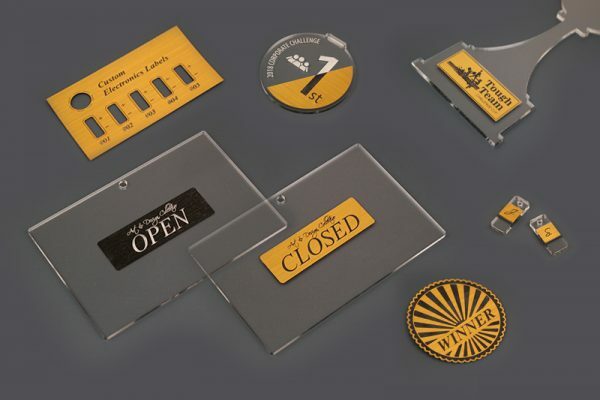 Lasers can cut and engrave designs from flat sheet materials such as acrylic, metal or wood. The outcome is always pixel perfect and, depending on the material thickness, a little bit three-dimensional (which looks really professional). Laser cutting also affords you lots of options from flat panel to individual letters to even backlit or edge-lit designs. For those artsy types who want to bring some uniformity to hand-painted signs (especially if it’s a design or text that is often repeated), you can cut custom stencils out of clear plastic PETG or other thin stock, too. 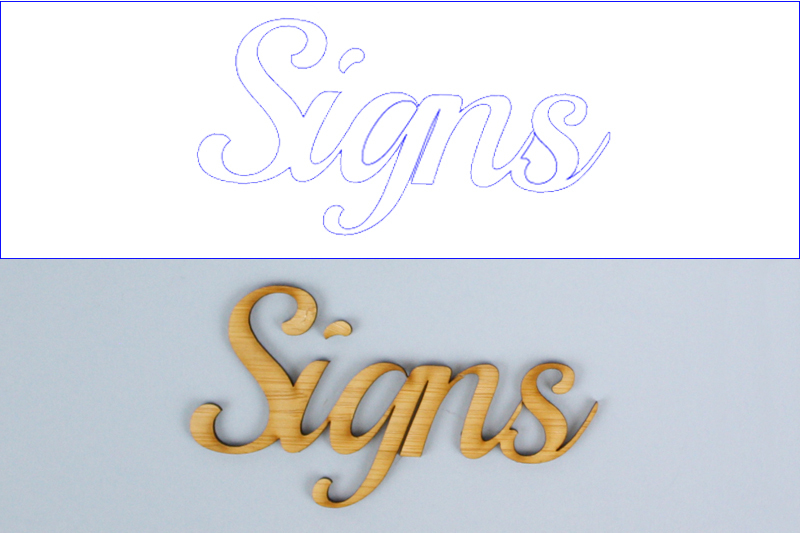 All you need to get started making signs via laser cutting is a vector design file (these tutorials on Adobe Illustrator and Inkscape can help), and the laser can get to work. 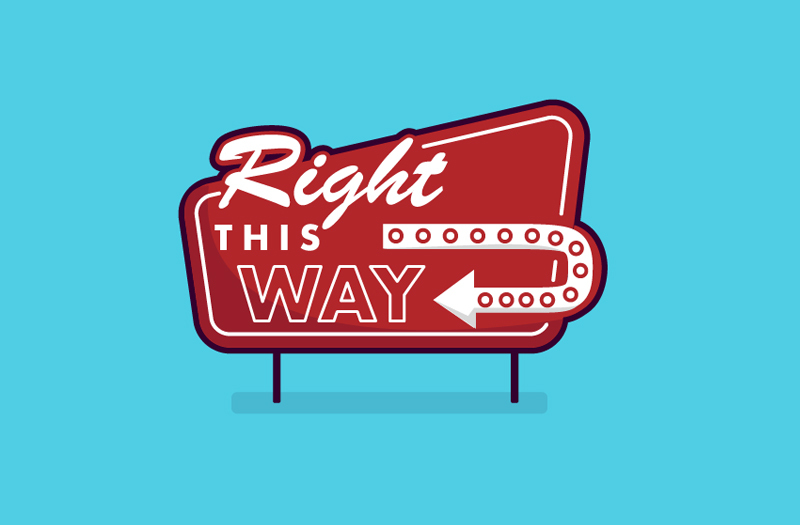 Pro Tip: As you’re designing, don’t forget to consider if the sign will be hanging, mounted or free standing so you can include any necessary holes for hooks or screws. Also consider the size and weight of the sign. 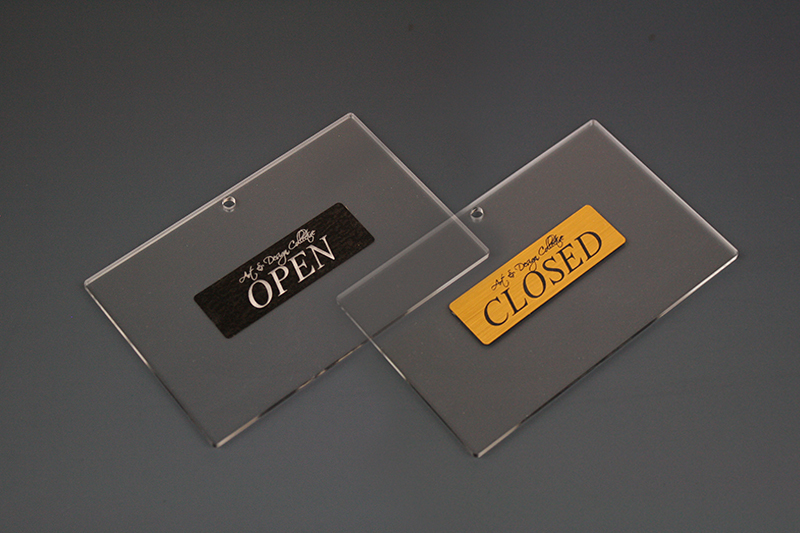 Small interior signs can easily be displayed with adhesive or small screws. On the other hand, large signage will need heavier hardware to install securely. Pro Tip: When in the designing stage, make sure you know these graphic design principles and elements so the sign is as aesthetically pleasing as it is informative. Note how effective the two-color acrylic is since it creates a high contrast image. And since citrus colors are associated with healthy foods and stimulating appetites, the orange color is not only thematically appropriate but also eye catching. 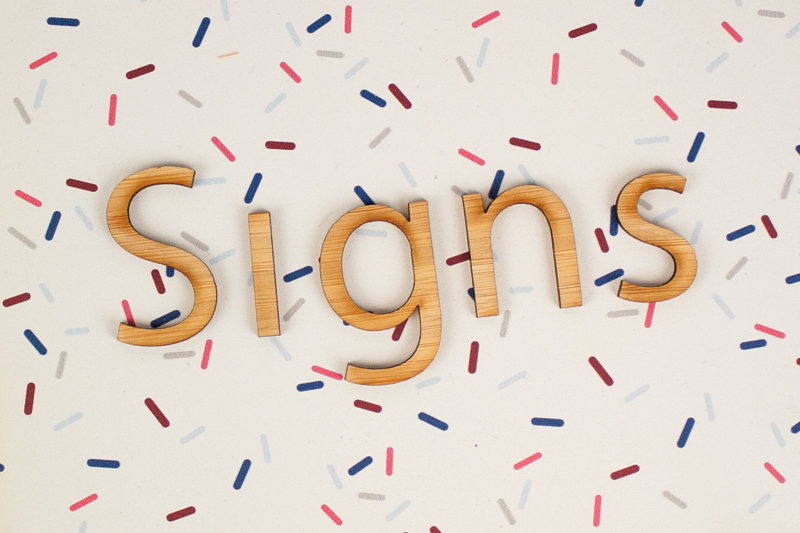 Pro Tip: If you’re making signs as products to sell, follow these cost-saving tips so you can minimize material waste and laser cutting time to maximize profits. 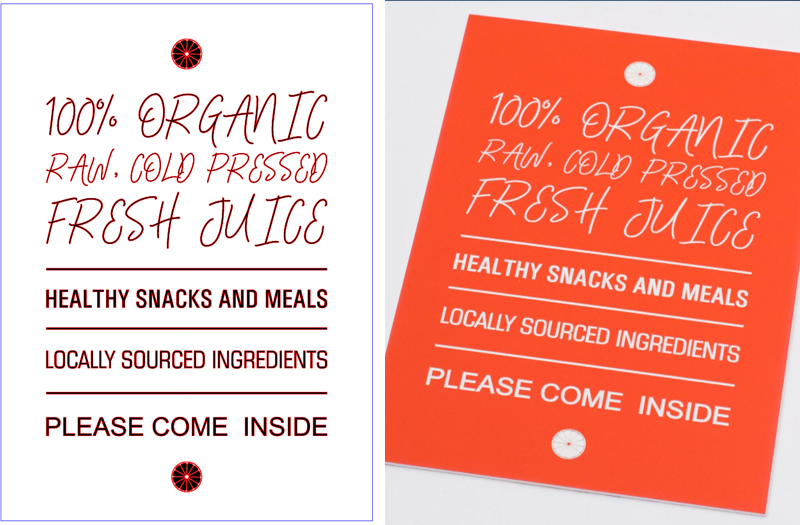 If you’re making a sign, providing a vector-based file is essential for lasers to cut the design properly. Pixel based pictures are a no-go. If the sign includes text, expanding the font to curves will ensure that the letters cut correctly without the actual font file being loaded on to the laser cutting computers because, ya know, there are millions of typestyles out there in the world. While the juice bar sign was a flat panel, perhaps individual letters are more your style. That’s cool. Keep in mind that you’ll need a level for installation to keep each piece in alignment when attaching them to their intended surface. 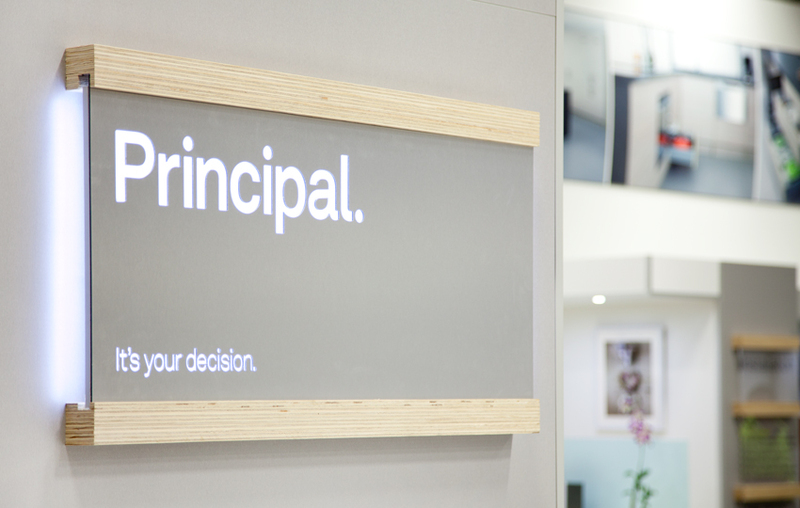 Whether used externally as street signage or internally to brand a lobby or conference room, signs deliver a clear and professional presence that not only makes a company memorable but also creates confidence in the brand. 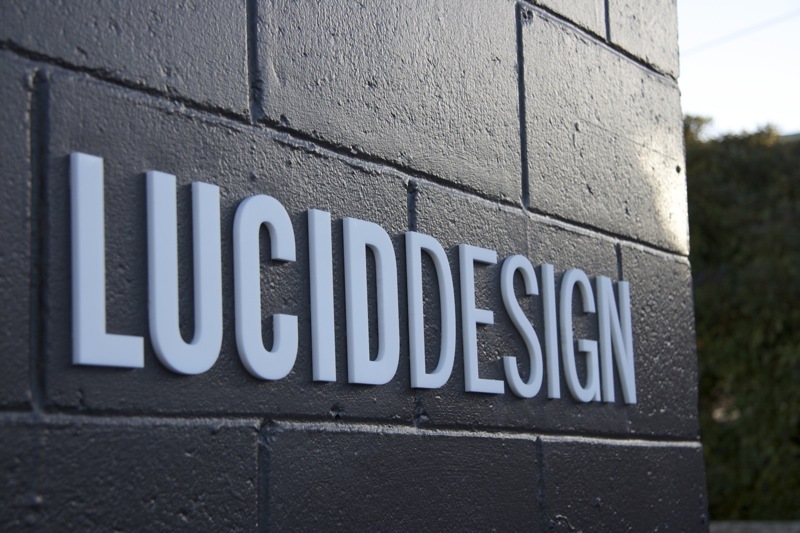 When Lucid Design moved into a new studio space, a year went by before they got any outdoor signage. But it was worth the wait. Like many small businesses on a budget, the Lucid Design folks decided laser cutting was the best way create the street signage they needed because it was not only cost effective but it also aligned with the brand’s identity. White acrylic gives the modern typestyle the crisp finish desired. While the same font family was used throughout, notice how “LUCID” is in bold so that the two words can be separated simply by visual weight. This laser cut exterior signage, designed by Jack Candlish for a Wellington, New Zealand coffee shop, was installed on macrocarpa slats. The result is an appealing contrast between the crisp black lettering and the warmth of the wooden background. With the slats serving as the horizon, the angled text also gives the appearance that the logo is taking flight. 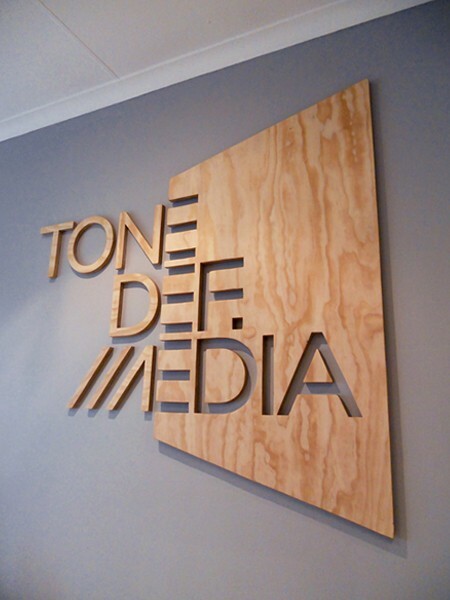 By using negative space, you can create the illusion of a two-color sign by simply laser cutting a flat panel design. 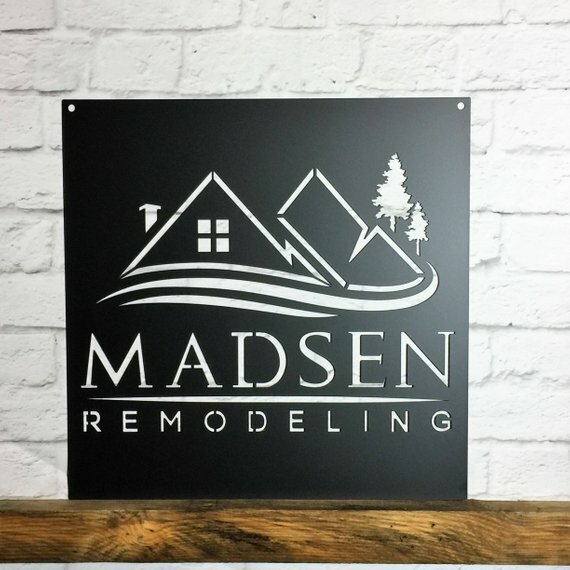 HouseSensationsArt uses this concept on steel business signs that are finished via powder coating so they can be used both indoors and outdoors. If you like this style, make sure to tab the insides of any rounded letters (A’s, D’s, O’s, R’s, etc.) so all the pieces remain intact and the letters are true to the typestyle. Here’s another great negative space example. This time, Tigermouse Design marries individual cut letters with a flat panel design, playing upon the negative space to create a unique—and very memorable—visual effect for this office sign. 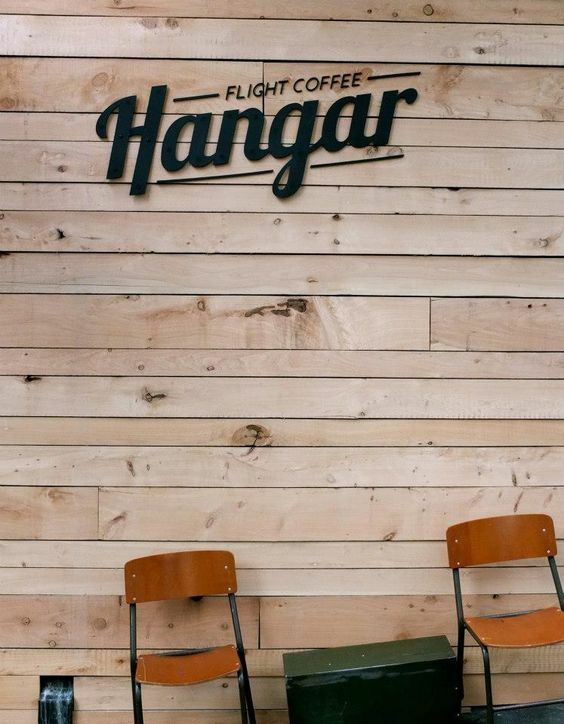 When in any commercial space, signage that identifies offices is a must. 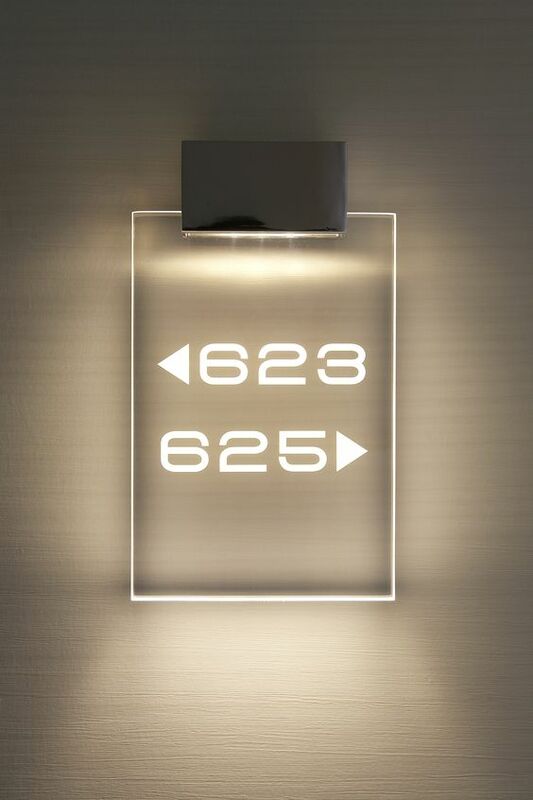 Edge lit signs increase readability and they give a designer look to interiors. This one has a wooden frame along the top and bottom edge to further focus the light to the engraved words for high visibility. But one of the most important signs in any commercial building is for the restrooms. Masahiro Minami, assistant professor of the University of Shiga Prefecture Department of Living Design, designed these simple yet effective restroom signs. Not only is the round shape visually appealing, but mounting them perpendicular to the wall and adding built in LED lighting also makes them very visible in the new school building in which they’re installed. In addition to traditional building signs, retail stores are full of opportunities for making signs. To complement traditional exterior signage, sidewalk signs are a great way to grab the attention of those walking by and further brand recognition. 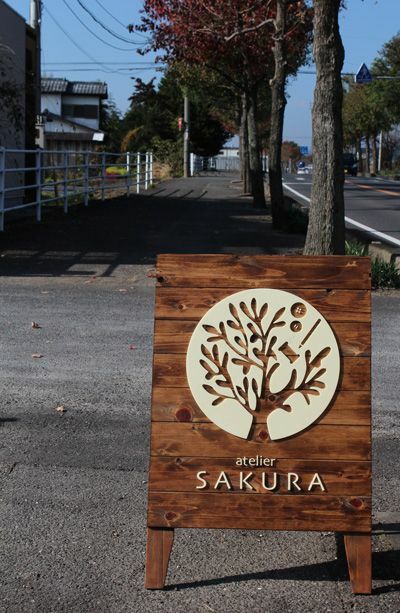 Check out this example for Sakura, a Japanese-based support center for people with intellectual, physical and mental disabilities. The logo encompasses some of the services the facility offers—from gardening to sewing and textile making—so being able to see it up close helps with understanding what the brand is all about. Using a free-standing, sandwich-board base allows the sign to easily be moved for changing signage needs. And the warm walnut stain on the base creates a nice contrast with the logo as well as an overall inviting aesthetic. Once the exterior signage gets customers to the door, they need to know if the shop is open. Making it clear that a store is open with a sign encourages people to come in. 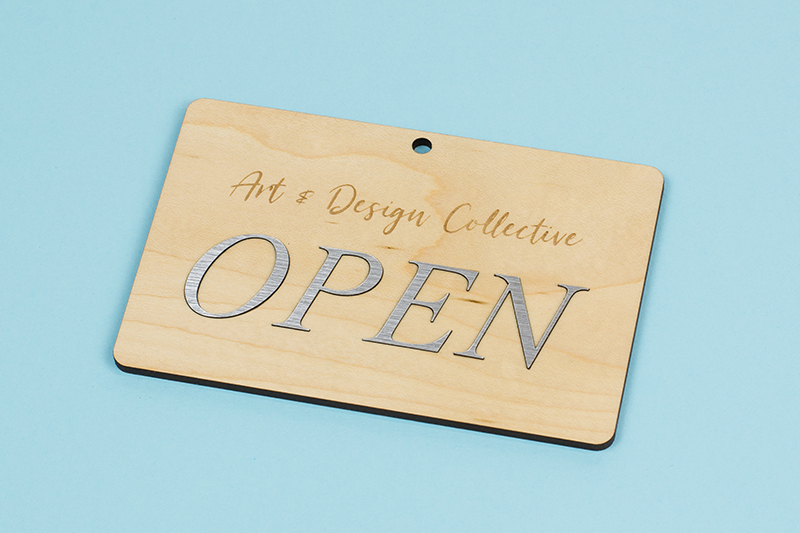 This open sign would look great with simple engraving on the birch plywood sheet. But we wanted to incorporate additional visual interest, so we combined the wood with a laser cut silver sticker adhered to the front to create a two-color sign. If you’ve wanted the ability to laser cut double-sided signage, there’s now a legit hack—and these stickers are the hero. First, engrave “Closed” on a gold-on-black acrylic sticker. Next, engrave “Open” on clear acrylic. Stick the two together…and…boom! A double-sided sign. (The black you see is the back of the sticker.) Clever! 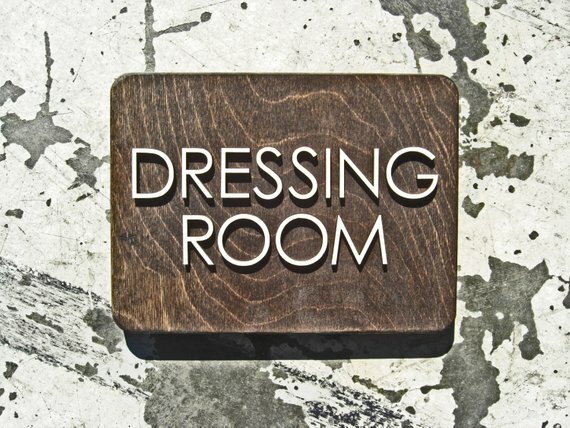 For retail shops that offer clothing, denoting dressing rooms is a must. This dressing room sign from grayskunk uses a stained wooden plaque as the base for laser cut letters. The dark stain and modern font give the piece a contemporary vibe, but you can use this concept with a variety of materials. What about a shiny red acrylic base with mirror acrylic letters? Luxe! Because hotels are such a personal experience, warm greetings go a long way toward how people feel in these spaces. 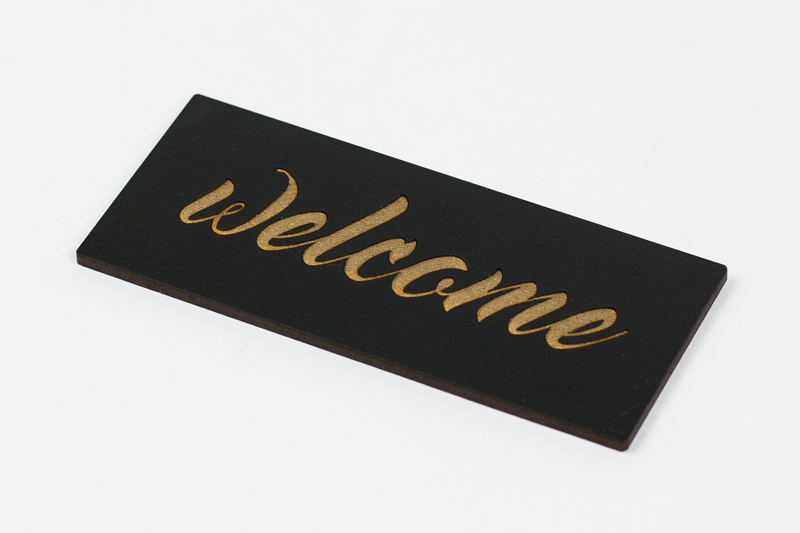 Not only are signs a good idea for defining things such as room numbers and floors, but this welcome sign will also make guests feel right at home. Sometimes the clerk has to step away from the front desk, especially if working solo during the night shift. 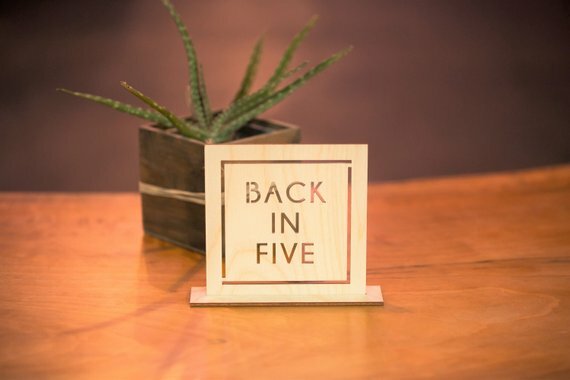 Let hotel guests know you’ll be back in five with an informational sign like this one from poststudioprojects. What’s great about this design is the smart use of negative space. To construct a sign like this, you’ll need to create a base plate with a rectangular slot in which to insert the sign so it stands up. Directional signage is essential for guests to find their way around the property. This directional room sign for the Crete, Greece-based Galaxy Hotel captures the hotel’s essence of where traditional meets contemporary and where sophistication greets functionality. The clear acrylic is edge lit, which allows the light to diffuse over the surface and catch on the engraved sections, making the numbers appear bright. Making personalized signs is quite popular on online sites such as Etsy. And with good reason. Today’s buyers don’t want their home décor to look straight off the showroom floor. Rather, they want specially curated and personalized spaces. 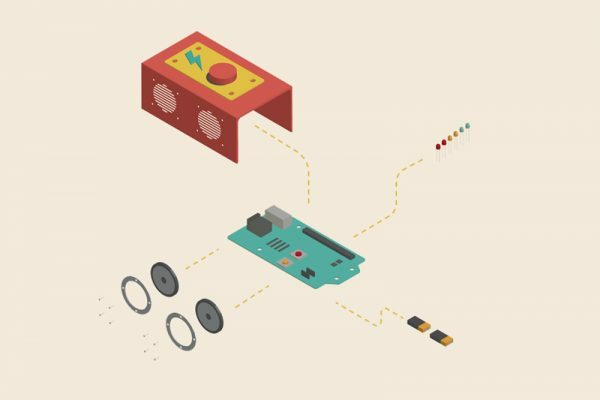 That’s good news for makers who can fill the gap with on-demand manufacturing. 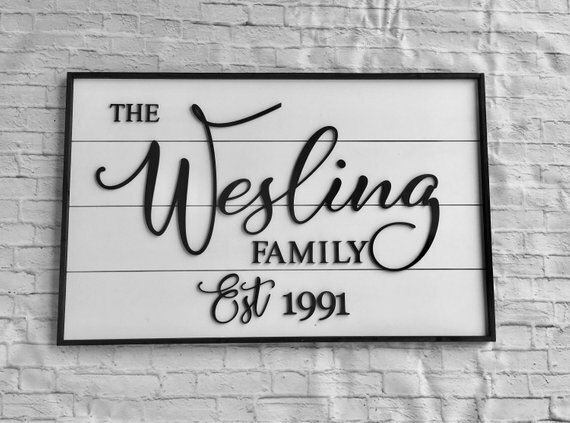 TheWordsmithStudio creates farmhouse style wooden signs that are personalized with the family name and marriage year. Both the black text and white background can be laser cut for either wood, acrylic or a combo of both depending on the desired aesthetic. But personalized family signs aren’t the only way to use signage in the home. There are all kinds of ways to incorporate signs within the interior design of kitchens, bathrooms, laundry rooms, kids’ rooms, offices and more. This script sign from SpringMeadowCo adds just the right amount of flair to this kitchen design. Notice how all of the lower case letters are connected to form one piece, making alignment during installation a breeze. 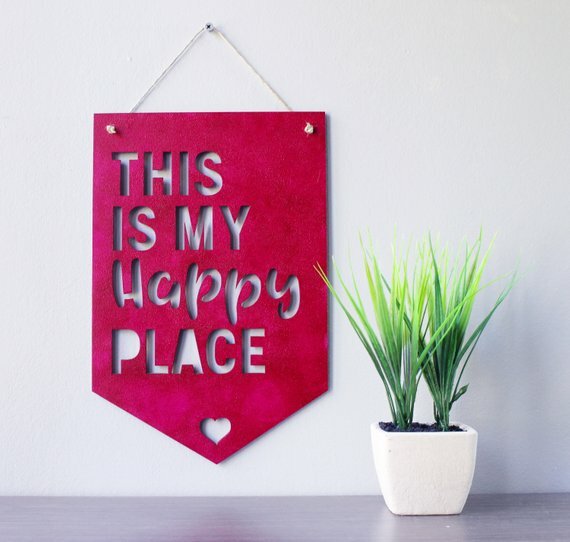 Home is where the heart is, so it should be a happy place. Zavyanne8 created this inspirational sign from plywood and then paints it for a custom finish. You could also stain the wood to create a cabin vibe or cut it in colored acrylic for more modern décor (and less hand-finishing). 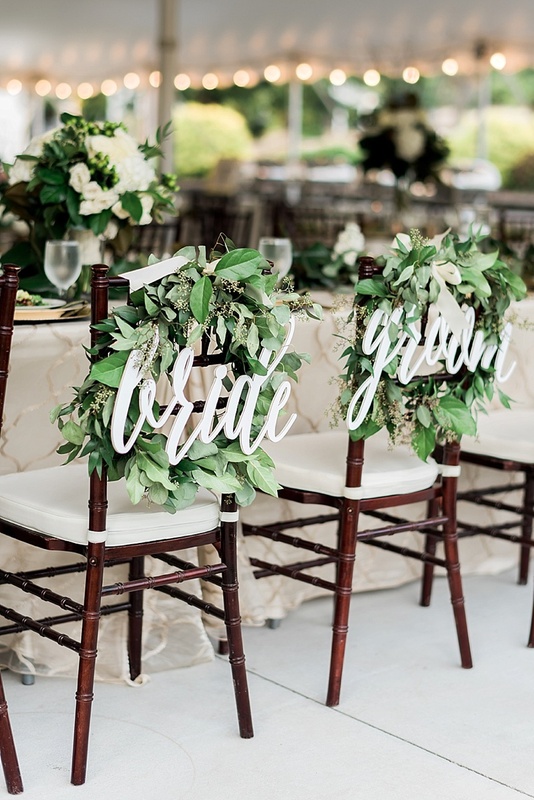 There are so many ways weddings can be customized to the couple’s personalities and aesthetic preferences, and signs can play a supporting role of the overall style of the event. Themes can be based around colors, seasons, styles (vintage, modern, rustic, romantic, etc.) or locations (garden, seaside, etc. ), and this gives makers lots of flexibility with designs that showcase the bride and groom—and their love. Speaking of love, we L.O.V.E. 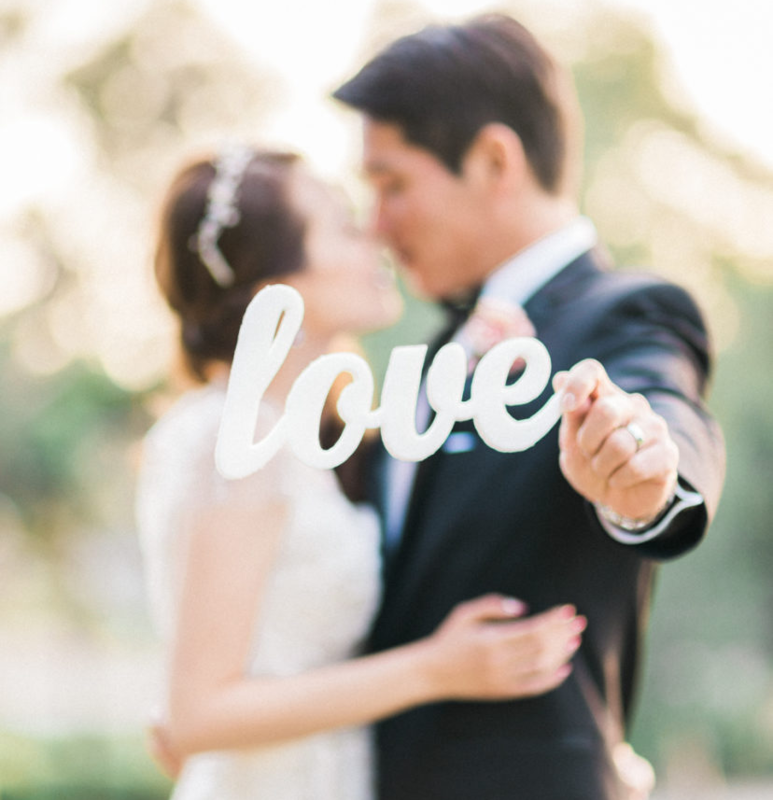 this photo from Ether & Smith of a happy couple with a laser cut love sign that was featured on Style Me Pretty. There’s nothing overly fancy about the sign, but the composition of the photo makes it one the couple will treasure. Signs can also be used as wedding decorations, such as these “bride” and “groom” signs (via A.J. Dunlap Photography) beautifully attached to greenery wreaths on the couple’s chairs for the reception. Wedding signs don’t have to be large to be effective. 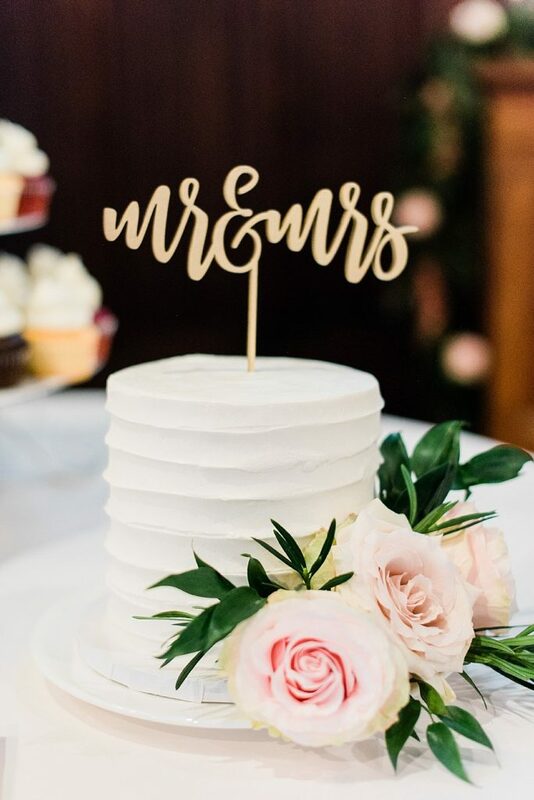 This small cake topper sign, as captured by A.J. Dunlap Photography, shows that a simple script “Mr. & Mrs.” sign adds the perfect finishing touch. When it comes to illuminated signage, back-lit signs are about as easy as it gets. How do you make a back-lit sign? Simply laser cut a flat panel sign and put a light behind it. That’s it! To make it more professional in appearance, you’ll want to build a box around it or you could buy a premade light box like we did here (it was $5). For another example of a light box sign design, check out this post from Instructables to make one of your own. 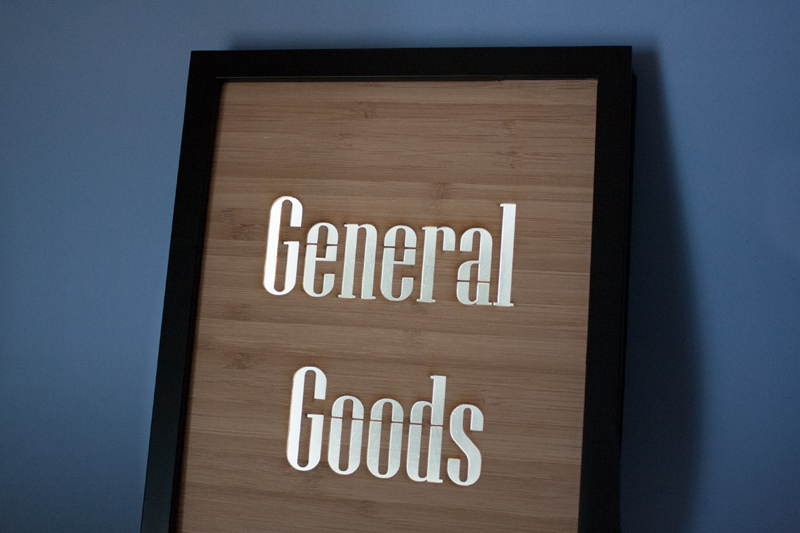 While it looks super sophisticated, edge-lit signs like the one below are surprisingly easy to make. Build a base with LED lights (or cheat like we did and buy one off the shelf! 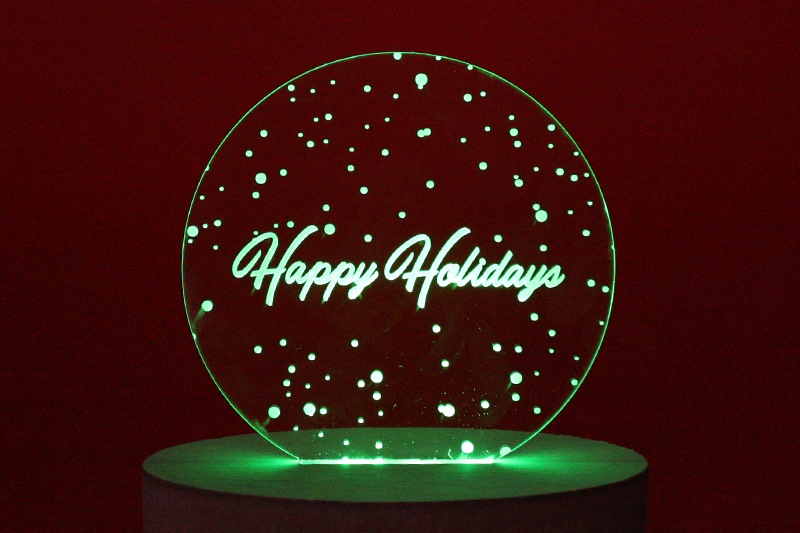 ), then laser engrave your design on clear acrylic. Where it’s engraved, the acrylic will catch the light and shine. For more ideas and tutorials on how to build edge-lit signs, check out this Instructables post and this Thingiverse how-to. Hopefully these ideas have shed some light on how to make signs to sell or use them to brand businesses. To see what’s already on the market and identify where there’s an opportunity to fill a void with your creativity, head on over to Etsy. 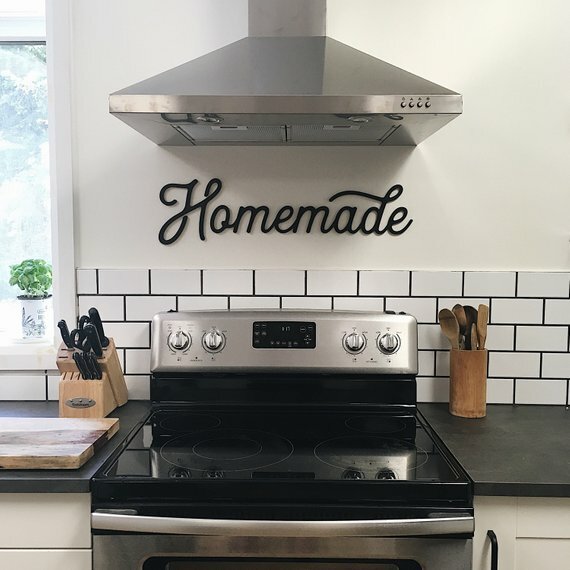 For even more ideas of what people like to look at (and thus hopefully buy) Pinterest is also chock full of ideas for making signs—from simple hand painted planks, CNC engraved plaques, carefully burnt wooden boards and more. Hey Anna, they do say work smarter not harder. Plus laser engraved edge lit signs look pretty cool!